This post is part of LxD Series in which I share my learning process about different technologies. Learn more about LxD here. Ok you saw earlier the design we are going to use for our application. Now it’s time to integrate that design in our Laravel 5 application. 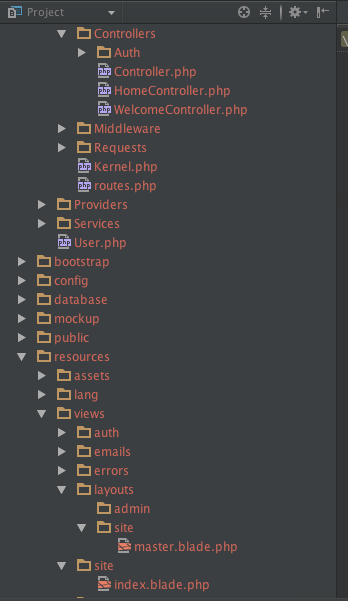 Before I go further, let me tell directory structure of Laravel to integrate our design. Layouts are actually part of views hence they reside in views folder. You have option to put all of your layouts within views->layouts folder or manage it better by dividing it into folders based on your site modules. For instance, Admin, Emails, Site etc. For my sake I created a site folder and created a blade template with name master.blade.php. All template files are actually PHP file with some special syntax and they will have .blade within file name. Look at code, it is same as we had for mockup. I set path of assets accordingly. In order include this template in our other pages, Laravel blade provides yield method. The blade file begins with the line @extends(‘../layouts.site.master’), which means this particular view file is actually part of master layout. extends actually take path of layout file. The dot notation is used to indicate sub folders. Hence layouts.site.master means that master.blade.php reside in layouts/site/ folder.